We’d love your help. 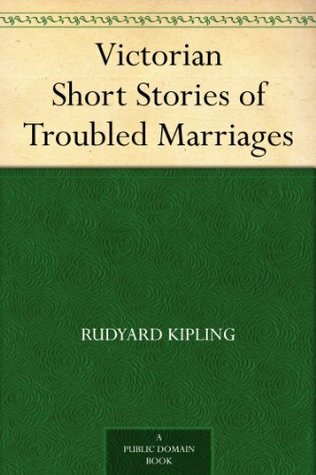 Let us know what’s wrong with this preview of Victorian Short Stories of Troubled Marriages by Rudyard Kipling. To ask other readers questions about Victorian Short Stories of Troubled Marriages, please sign up. A group of Victorian Era short stories. Rudyard Kipling is listed as the author because his story is first. There are also very good stories included by Arthur Conan Doyle and George Gissing, among others. This is a selection of five short stories with the common theme of unhappy marriage. As they are all five written during the Victorian era, they give the reader a good picture of what was and was not considered tolerable by social mores in a marriage of that day. For that historical purpose alone, there is much value to reading this collection. Some of the stories are particularly well written as well, though, given the collection even more merit. THE BRONCKHORST DIVORCE-CASE By Rudyard Kipling ( This is a selection of five short stories with the common theme of unhappy marriage. As they are all five written during the Victorian era, they give the reader a good picture of what was and was not considered tolerable by social mores in a marriage of that day. For that historical purpose alone, there is much value to reading this collection. Some of the stories are particularly well written as well, though, given the collection even more merit. "Bronckhorst was not nice in any way. He had no respect for the pretty public and private lies that make life a little less nasty than it is." Mr. Bronckhorst was verbally ugly to his devoted wife, making her life a misery and degrading anything that gave her pleasure. When another officer, Biel, is kind to his wife in public, Bronckhorst bribes his servants to give false testimony and takes Biel to criminal court for dallying with his wife. His friends call a man they known named Strickland to come and take care of the situation with the native servants, which he does, and Bronckhorst hasn't a shred of contrived evidence left. Mrs. Bronckhorst stays devoted to her husband and they leave India and return to England. I can't help but think that the character of Strickland must have been known from other stories, because otherwise his appearance and working of miracles makes no sense. As it is, without any background knowledge, this is a very weak story. The marital dynamics are glossed over and the entire point seems to be about Strickland's genius. With the exception of a few well written lines, like the one quoted, it is a very unimpressive story. "Every affront or grievance, real or imaginary, since the day she and Willoughby had first met, she poured forth with a fluency due to frequent repetition, for, with the exception of today's added injuries, Willoughby had heard the whole litany many times before." This is a well written story from beginning to end. D'Arcy describes her characters and their emotions effortlessly and intimately. The plot is gripping and emotional. The reader watches as Willoughby makes the mistake that will cost him his happiness, an inappropriate marriage, but D'Arcy's writing keeps the reader still hopeful til the last heart wrenching sentence. After reading this story, I most certainly am going to search for more of her work. This story is a quite different from Morrison's detective fiction (Martin Hewitt, Investigator) and shows an emotional range I would not have expected, having read the other first. Mrs. Jennings is a no-good woman who doesn't keep house or take care of the children and is often off drinking. Mr. Jennings "never grew out of his courtship-blindness" and wouldn't hear bad spoken of her; he just came home from work and did her duties as well as his own. His devastation when she runs off is sad to see, and Morrison does an excellent job of portraying the broken man. This is another of those Holmes tales where the great detective solves this, that and the other through his knowledge of things like train schedules and wine vintages. While I admire Doyle's often complex mysteries, his way of solving them has always been annoying. The marriage element enters through the victim and his widow. He is found dead and she states that thieves broke in, tied her up and bashed in her husband's head. Holmes not only comes to the truth of the matter, but chooses to play the part of the law as well. It's an average story, with the solution no surprise except for how Holmes gathers and deduces his evidence, generally unknown to the reader. I picked this up because I liked the sound of the title. The short stories are well chosen, and on a whole I liked the collection. Extra points for the Sherlock Holmes story, I hadn't read that particular narrative before. The writing was better than it's counterpart, but reading about unhappy marriages, especially in a time period where there was really no legal escape from them, was a real downer for story after story. A nice little collection of short stories with the focues on marriages gone bad. The best two are the Kipling and the Gissing short stories, which strangely, don't blame the woman.